Here is a brand new snap in style lens cap for your Rollei 35 rangefinder camera. This is not original equipment, it is a plain black plastic lens cap made in JAPAN. It will fit all of the cameras with a Sonnar 40mm f2.8 lens. Nearly all the Rollei 35 rangefinders made in GERMANY use this size lens cap. I know may people need this cap and have a hard time finding an original Rollei lens cap. Honestly, the originals can be pretty expensive and they don't stay on all that well. That is the one flaw of the Rollei camera, a lousy lens cap. This cap is great, stays on well, and looks nice. Here is a brand new screw in style lens cap for your Rollei 35 rangefinder camera. This is not original equipment, it is a plain metal lens cap made in JAPAN. It will fit all of the cameras with a Sonnar 40mm f2.8 lens. Nearly all the Rollei 35 rangefinders made in GERMANY use this size lens cap. I know may people need this cap and have a hard time finding an original Rollei lens cap. Honestly, the originals can be pretty expensive and they don't stay on all that well. That is the one flaw of the Rollei camera, a lousy lens cap. This cap is great, stays on well, looks nice, and I have a whole bunch of them. Here is a nice item for the Rollei 35 camera user. The Rollei cameras have two sizes of front rings, only the Sonnar 40mm f2.8 lens is 30.5mm diameter, all other lenses are 24mm diameter. The cap is machined out of aluminum; screws right into the front of the Rollei camera lens like a filter. I know may people need this cap and have a hard time finding an original. Honestly, the originals can be pretty expensive and they don't stay on all that well. That is the one flaw of the Rollei camera, a lousy lens cap. This cap is great, stays on well, looks nice, and I have a whole bunch of them. 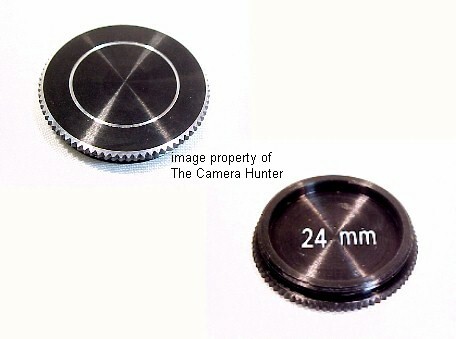 Here is a brand new ultra soft shutter release button for your Rollei Rangefinder camera. This little item is top quality, machined out of solid brass and chrome plated, made in JAPAN. Some people are all thumbs. Pushing the shutter button on a camera like the Rollei 35 pictured is nearly impossible without this button. Consequently you are left with camera shake and blurred photographs. It will screw right in to nearly every Rollei camera ever made. As long as your cameras shutter button has a threaded hole in the center his will fit any camera model whether it's made by Rollei or anyone else. I really like having one on my camera. It makes it so much more convenient to find the shutter button fast and reduce camera shake.